Spark plugs are small but play an integral role in how well your vehicle works. If you’re like many vehicle owners, you might not know what spark plugs do and when you need new ones. Choosing the best spark plugs can be difficult when they all look similar. Read on to find out more. How Do You Know When It’s Time For New Spark Plugs? Even if you consider yourself to be mechanically inclined, it can be difficult to know which type of spark plugs to purchase when it’s time to replace the ones that are in your vehicle. Maybe you’ve never changed the spark plugs on your own, or you’ve simply chosen the same brand as long as you’ve owned your car. While the majority of spark plugs are the same in many ways, like many integral car parts, there are some that are better than others. Not only do we review the best spark plugs, but we give you a few tips on how to tell when you need to replace your spark plugs. While many people who replace their own spark plugs know what the plugs do, others don’t really know (and probably haven’t thought about a spark plug’s role in regards to your car). Much as the name suggests, a spark plug provides your car’s engine with a small ignition source (or a spark); this is essential to starting your vehicle. The spark plug will ignite the fuel, which will put your car’s pistons in motion. No one likes the idea of fire and gas, especially when it comes to vehicles, but a spark plug creates enough of a fire that our vehicles can start and run smoothly and properly. Even though spark plugs are small, they are durable and typically don’t need replacing until every 30,000 to 50,000 miles. How often you need to replace your spark plugs depends on many things, and if you have a newer vehicle, you may have plugs with a longer lifespan. A quick visual inspection should let you know whether you need new spark plugs. If they look undamaged and the engine is running smoothly, you can wait. Some spark plugs may have a red coating on them; this results from additives in gas. Just wipe the plugs clean and put them back. If the electrode looks worn or damaged, it’s time for a new plug. If you suspect that your vehicle is in need of new spark plugs, you may decide to head to your local auto parts store and purchase whatever is in stock or is the least expensive. Unless you’re an expert on spark plugs, you don’t know if you’re choosing the best spark plugs. You can ask a store associate for advice, but most of the time they will just try to upsell you on the most expensive spark plugs. So, how do you know if you are getting the best spark plugs? You let us do the research and narrow down the options to some top picks you can trust. You might be wondering how we’re able to slim down the options and only pick the best. Most of our research consists of reading dozens of online customer reviews and testimonials. We’re careful not to focus solely on the positive reviews because the negative feedback is just as important, especially since our goal is to create a well-balanced review. After we’ve read through reviews, we rate our top picks using a five-star rating system. Our favorite choice gets five stars, which means it exceeds our expectations and received overwhelmingly positive reviews. We don’t always give all of our top choices a full five stars, but it doesn’t mean they aren’t good spark plugs. We only recommend spark plugs that we would use in our own vehicles. Now that we’ve given you a quick look at what a spark plug does and some signs that indicate a replacement is due, it’s time to take a look at our “best of” list in regards to spark plugs. We will give you all the information you need to decide which ones are best for your vehicle. We start out our list with our top pick and list the rest accordingly; remember, they are all great options. While we do our best to find a spark plug that will work in a variety of vehicles, from motorcycles to marine craft, you should always double-check that a spark plug is designed for your vehicle before you buy the spark plugs. These NKG alloy plugs have a 0.6mm welded fine Platinum tip, which helps them be some of the most durable and consistent plugs on the market. The plugs are designed to improve the throttle response and to prevent flashover and fouling. Each plug also has anti-corrosion, anti-seizing properties, and a secure gasket ensures no fuel leakage. 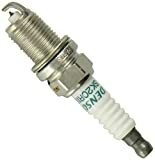 These spark plugs are compatible with a variety of vehicles and include street-touring, cruiser, sport, and off-road motorcycles, ATVs, scooters, snowmobiles, and marine personal-craft. 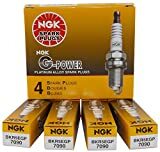 Users of the NGK plugs were happy with the “instant” results and replacing old plugs with the NKGs seemed to resolve numerous vehicle issues. Most users who were happy with the spark plugs thought that they performed as expected. Those who were not satisfied with the plugs complained most frequently about the plugs not fitting their vehicle (this most likely could have been prevented if they had double-checked the compatibility before buying). Others had to replace their NGK plugs well before the standard replacement period. Bosch has been manufacturing spark plugs for over a century, and they remain a top-rated customer favorite to this day. This Bosch plug has a double Iridium firing pin, which is designed to make the plug more durable (Bosch says up to 4x more than standard plugs). There is also a seven-year performance guarantee for this Bosch model. The 0.6mm wire firing pin allows for the engine to fire up every time. A 360-degree laser-welded center electrode means that the plug is more durable than others on the market and nickel-plated shell ensures no anti-seize is necessary. Users of the Bosch plug love the easy installation, and a few commented that they got over 100,000 miles out of the spark plugs. There were very few complaints about the Bosch plugs. Some people didn’t think they were anything special. Overall, most users who reviewed these spark plugs were pleased with the performance. This Champion spark plug is a good multi-small engine plug. It has a basic design and a standard copper core center, but it remains a top-rated spark plug. It has a TinTac and Ultraseal shell to prevent corrosion, and it meets ISO and SAE standards. Many users chose the Champion spark plug for riding mowers and other non-transportation type vehicles. Most were happy with the performance and said that the plug instantly improved the function of the engine. For price and design, the majority of the people who purchased this “no-nonsense” Champion plug were satisfied and had no complaints. While there were few complaints about the spark, most of the negative feedback was in regards to broken or damaged plugs upon opening the box. If you’re looking for other spark plug brand that offers reliability and durability, Denso manufactures an Iridium plug. It has similar features to the Bosch plug that we reviewed, and it’s designed for acceleration, longevity, and durability. According to the manufacturer, their Iridium spark plug is 6 times harder and 8 times stronger than platinum. It has a 0.8mm fine wire Iridium-tipped center and can withstand “extreme” driving, such as racing. These Denso spark plugs had overwhelmingly positive feedback, and most users either knew what to expect or were pleasantly surprised by their performance. The users who unhappy with these spark plugs did not know that the plug would not fit in their vehicle’s engine. These Iridium spark plugs are unique because they have a one-piece suppressor seal that blocks out radio frequencies, which can affect the electronics in vehicles. The fine-wire Iridium electrode improves overall engine performance by burning away excess carbon, improving fuel economy, quick acceleration, and better performance when cold starting. Like other Iridium spark plugs, the ACDelco is designed to resist corrosion and are more durable than standard plugs with copper cores. Some users of the ACDelco plugs thought that their older vehicles “ran like new” after replacing their regular spark plugs with the Iridium ones. Most were happy with the overall performance and saw an improvement in how their engine functioned. Most people who didn’t like the spark plugs had damaged plugs, so they didn’t get a chance to see how well they worked. Not only did we choose some of the top-selling brands of spark plugs but we also chose the top-rated. While the spark plug that you might need might not have made our list, it’s safe to say that if you select a plug from any one of these brands, you can be confident in its performance. If you’ve changed your own spark plugs for years, you probably always replaced them with a copper spark plug. Copper plugs are considered to be the most basic, the least expensive, and it’s what many people know. While copper isn’t considered top-of-the-line anymore, it doesn’t mean that they are the worst choice. Some older engines actually work better with copper plugs. As we already mentioned in our reviews, Iridium and Platinum spark plugs are becoming more popular. Even the century-old brands, like Bosch, are making the switch. Iridium plugs often have the best performance, but you can expect to pay the most for them. Platinum plugs are good and are often seen as a “happy medium” between Iridium and copper. It’s important to note (again) that you need to know the exact size spark plug you need, whether you’re replacing a mower plug or one on your car. Most of the complaints on every plug we reviewed were in regards to a plug not fitting the engine. Some reviewers had issues with the online “size guide” being incorrect. When in doubt, go to a store in person or talk with a mechanic. Unless your spark plugs are difficult to access, you should be able to replace them yourself. If you’re not sure how to change them, there are plenty of YouTube videos online. Not only can changing your spark plugs save you some money, but it can help you “know” your engine a bit better.